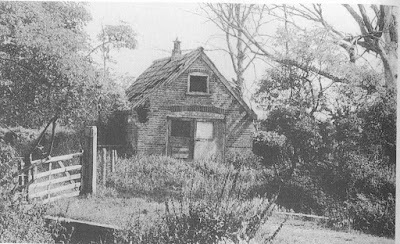 Eton Wick History: Eton Wick: The Mortuary. This picture of the Eton Wick mortuary was taken around 1960 just before it was demolished. It was built in 1913 on the north side of the brook running along Common Road approximately opposite Albert Place, sharing the entrance to the Blacksmith's forge. The occurrence of drownings in the river at that time warranted such a facility; before it was provided the accepted practice was to lay the bodies out in the rear quarters or cellars of public houses, where the subsequent inquest was held.